Safely and effectively cleaning your roof can be one of the most challenging tasks if you own a residential or commercial property home. In addition to removing dirt and residue from weather and environmental pollutants, keeping your roof structurally sound and intact year after year requires routine maintenance. Our residential and commercial cleaning professionals at Winnipesaukee Cleaning offer several environmentally friendly solutions designed to clean your roof and to protect it from potential hazards. If you have struggled with (or neglected) giving your roof a good cleaning, our team at Winnipesaukee Cleaning can help. For more information on our services and to find the ideal option for your property, contact our Meredith roof cleaning professionals at (603) 279-4769 to set up your free estimate today! The process soft washing uses a chemical make-up additive that is completely biodegradable. This means there are no phosphates in our chemicals. Phosphates are what is added to most soaps to make them foam/create suds. The chemicals break down into carbon and water within twenty (20) days of their introduction into the environment. Soft Wash can be used to clean mold, mildew, lichen and moss of materials, objects, and surfaces. How does Soft Wash work? Many have heard of pressure washing, a process in which liquid is sprayed at a high pressure to assist in removing debris. Pressure washing is relatively quick with instant gratification, but can also cause further damage. Soft Wash allows for time to assist in the process and is kind to the surface it is cleaning. Soft Wash is a process in which liquid is sprayed at a lower pressure. The chemical does most of the work. 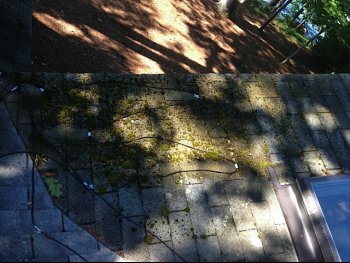 Mold, mildew, lichen and moss have attached themselves to the surface, usually a roof, and embed their roots deep into the asphalt shingle, causing damage and unnecessary weight to the roof structure. Mold (black streaks), also bacteria, eats away at the limestone in the shingle causing erosion. Soft Wash is applied to the roof, killing the mold, mildew, lichen and/or moss. At this stage the natural item slowly releases itself from the shingle. Even though mold, mildew, lichen and moss are all low lying natural material they do have small root structures. These root structures grow into the shingle, staying firm to your roof. Soft Wash kills the natural item, allowing for the natural item to release itself from the surface. Wind and rain remove the natural item off of the roof. Should I cover my plants around my house? Generally the chemical process does not kill matured plants or grass around your home or below the roof line. The chemical used, if diluted, is completely harmless to all plants. We pre-wet vegetation around the house as a precaution and then complete a final rinse when we are finished. Most NH perennial outdoor plants have a strong resilient nature, some annual plants can be more sensitive. We recommend if you feel some of your plants may be of concern, please cover them before we come to clean your roof. My roof had black streaks now everything looks white? This is a GOOD sign. Soft Wash does not pressure wash natural items off of your roof. The natural items die and release themselves. The natural items will turn beige, cream, to white, letting us know they are dead. The next step is allowing for wind and rain to remove it. How long does the process take? The time we spend at your house can vary. There are many factors with how long the application process may take; size of the roof, pitch of roof, level of natural growth etc… After the application process is complete, the time it takes for the natural items to fall off also can vary depending on the level of natural growth. Will you need to walk on my roof? The easiest answer, sometimes. We do not always need to access your roof from roof level as our applicators are long enough to extend to the top of most homes roof lines. In certain situations we do need to walk on the roof. We, at Winnipesaukee Cleaning, are trained in safety and skilled in walking on roofs, along with insured and bonded, rest assured we are prepared to complete the job with quality and safety at the forefront. Does weather play a factor? Yes, weather is a key part of the chemical process. The enzyme that makes up the additive ideally needs air temps to be above 50 degrees. While mist or light rain may not be an issue to the chemical, rain can cause issue in the process and accessing your roof. If weather becomes an issue we will ask to reschedule your cleaning.